Our Old Miners Cottage: Old Miners Cottage Floors, explained! Old Miners Cottage Floors, explained! I thought I'd share some info with you about our floors! 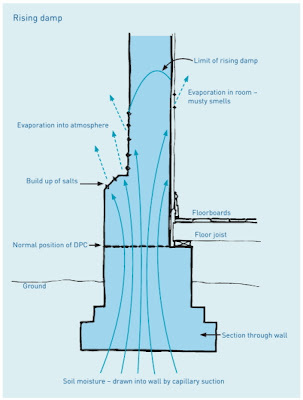 It's rather complicated to explain without a diagram - thankfully the booklet from Heritage Victoria "Salt attack and rising damp - A guide to salt damp in historic and older buildings" has just the diagram and information we need. Copyright © 2008 Heritage Council of NSW; Heritage Victoria, Department of Planning and Community Development; South Australian Department for Environment and Heritage; Adelaide City Council; and David Young. This is a great example of what our old cottage should look like - minus the rising damp! The DPC (damp proof course) in our case is the stone itself. They don't let moisture up as easily as brick would, for example. The thinner brick is the shelf that the floor joists would have sat on at one stage in the past, but we won't be relying on them for that function in this area due to the damage. The two rooms which were built first are in much better condition than this wall is. It is our hope that once we have re-pointed (put a lime mortar back between the bricks) and plastered the wall, we will put in a traditional wood floor with concrete stumps to hold it up (rather than rely on the steps on the wall). 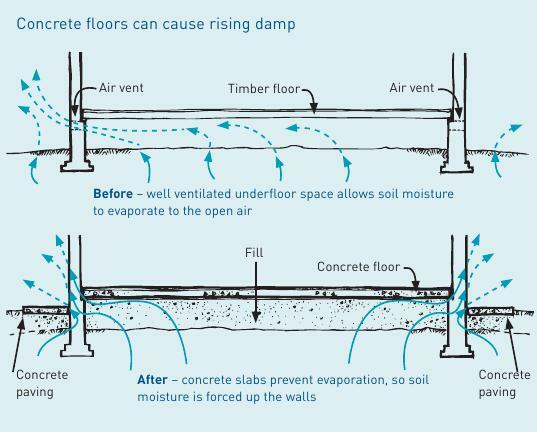 The booklet I mentioned above also explains why concrete floors create rising damp. Basically, the fill used below the concrete (and the concrete itself) stops airflow and natural evaporation of the moisture. It also bypasses the DPC (in our case, the stones) which is there to prevent moisture wicking up the bricks. Here's one more helpful diagram from the booklet so it can explain what I mean!